Home - Safe and Sound! Home again, safe and sound! Ever thought about what means? 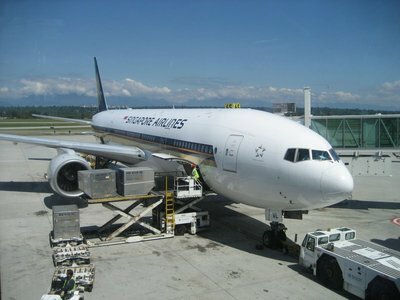 Safe - that's simple: our plane didn't crash. Sound - meaning still of "sound mind." A little more complicated to judge, but I think we've done it. My parents met us at the airport and we were all smiles and hugs. Jenn's foot is a little better, Anica's cold is better and despite the time difference, we couldn't wait to see our "new" home. We've been away for eleven months and one week, after living in the condo for just three months. We even went to Swiss Chalet for dinner. Very Canadian, actually. Then the moment of truth. Home. Everything looked better than I remembered: the lobby, the elevator, our front hall, the walls we had painted, our furniture. Our parents had the place spotlessly clean and had stocked the pantry, too. Lucky us! There were things I'd forgotten. As I washed my hands, I stared down at the taps, thinking, it's like I've never seen these before - completely unfamiliar. And I have clothes...so many clothes! Not really, but more than I had in my backpack. So we're running around the apartment, trying to figure out where lights are turned on, what cupboards the dishes are in...it's what we've been doing every week on the road. The calendar on the fridge was as we'd left it: July 2007. We looked at all the appointments scrawled in, leading up to the day we left. July 30th last year. Anica enjoyed playing with her toys for most of the next day. She's got so many toys! I thought we'd pared down when we moved, but there's still so much. No more than her friends do, but so much more than she had with her on the trip. So much more than children in many of the other countries we've visited. We'll be giving more away. Anica's been very willing to make choices of what to give up. Partly she's just older and no longer interested in the same things. The only thing I found sad was that Anica's forgotten almost all she learned about playing the piano. She took two years of lessons, but she's going to have to go back to the beginning now. She'll pick it up much faster this time, because she's learned it once before. Now she's enjoying sitting down at the piano, and picking out the songs from her beginning book, so that's a positive thing. But it's a little "Flowers for Algernon." Since we talked endlessly about "when we come back home," we have some decisions to carry out that we're tackling immediately. Before inertia sets in. Like shedding even more of our possessions. There are things we didn't even remember we had after a year. Other things we didn't have with us and never missed. Unfortunately, we can't live where we do, and work where I do, and not have a car. So we went out and leased a new car. The "green" angle here is that we used to have two cars! The weirdest part might be not having a phone yet. They're coming tomorrow for that. Right now, it's like we're still travelling - our only way of getting in touch with people is by piggybacking a free wi-fi signal. There's still a feeling of "it hasn't sunk in yet." Boy it feels weird to be home! One second wheir on a airplane being served ice cream and twix, next second meeting Nana and Grampa at Toronto Pearson airport having dinner at Swiss Chalet. Then home! I'm having a lot of fun whith especially thanks to Emily, Sarah and Sam who have been lots of fun (Emily as the big unicorn, Sarah another and Sam the chihuahua I play with). Well I'm a bit tired now, so G.N. Here's a Canada Day to remember that initially we forgot. We were in the famous Hamley's toy store on Regent Street (established 1769) when I saw a bunch of people all decked out in red and white Canada clothing. They even had maple leaf face paint. Now I've heard some people go out of their way to show they're not American tourists, but this was ridiculous! Then it dawned on me - it's July 1st. Canada Day! This year is the 141st anniversary of Canada's Confederation. We're not as old as the Hamley's toy store, but still...it's a special day. Especially when we Canadians have been away from home soil since July of last year. I got talking with the Canadians and they said the Embassy (sorry, "High Commission") was throwing a party in Trafalgar Square. So the three of us walked down there, and took in the scene. "Welcome - step in to Canada" read the banner. Here's some of the things going on: music (by Canadian performers we'd never heard of), ball hockey, face painting, flags, and booths promoting our various tourist regions. There were also some "typical" Canadian products being sold, like Tim Horton's donuts and Moosehead beer. Or the guys who were selling the Canadian grab bag, which included Kraft Dinner and Dad's Oatmeal cookies. My colleagues used to tease me because I ate those exact cookies every day for years at lunch. Hey, at least they're quintessentially Canadian! After we'd had our fill of the festivities, we headed over to the Sir John Soane's Museum. It's actually just the house of a famous architect, left to the City of London exactly as it was when he died. He was extremely eccentric. Lots of mirrors and tricks to increase space and light. Lots of objects from all over the world. Soane has Seti I's sarcophagus in his basement having outbid the British Museum for it. The security guard showed Anica how, in the Picture Room, the walls open up like pages of a book to reveal more pictures behind. What really captivated Anica was Sir John's devotion to his favourite dog, Fanny. This pet has a huge tombstone in a courtyard of the house. There are several oil paintings of Fanny elsewhere in the house. Mrs. Soane isn't quite so well-represented. By this point in the day, Jenn was pretty sure that her right foot, which had been troubling her for a couple of days, was going to need some serious rest. She's apparently aggravated an old injury to do with the arch of her foot. It's strange, but fortunate in a way, that she's made it through over eleven months of travelling, and this is only flaring up now. She's going to take the day off tomorrow, and suggested that we finish today by going on the London Eye. 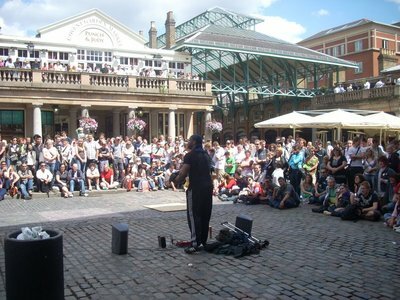 That's something new in London that we wanted to do. It was a beautiful evening for a ride on British Airways (who built the London Eye). The crowds were huge, but they move 25 people onto one of the 32 ferris wheel cabins every minute. It goes up 135 metres. You can look straight down (because of the shape of the cabin) to the Thames River. For Jenn, her fear of heights and bad foot meant that she enjoyed the ride from a seat on the bench in the middle of the cabin. Still a great view, but no vertigo. We ate at a McDonald's (pretty sad, I know, but it had a play-area for Anica and allowed us to use free wi-fi for as long as we wanted), then headed back to our flat. The temperature hit 27.8 today - the hottest day of the year in London so far. Happy Canada Day, eh! Today we went to Hamleys. I bought a panda with a bamboo shoot in his mouth. Also at the store Mum and Dad bought me a fairy coluring book and 24 crayons for coluring on the plane home. 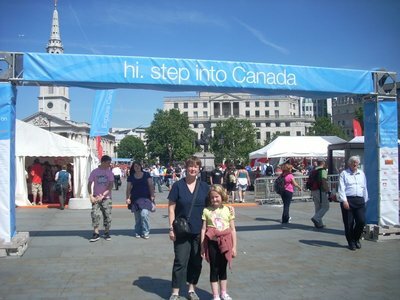 We then Hamleys and found out there was a Canada Day party at Traflager so we went there. It was really cool. Then we went to Sir John Soane Museum. I liked seeing Fanny, the sargophagus and painting. 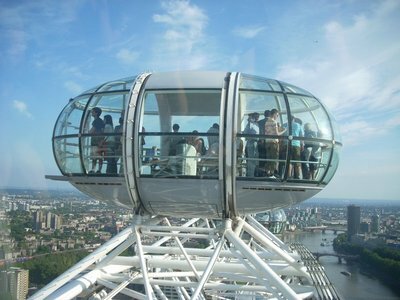 We then went to the London Eye. It was really cool and seemed pretty fast but from far away it seems slowwww...! We then went to McD for dinner, went home, introduced Chengdu Xinhha [the new panda] to Quacky Quackers, Baby Young, Nessie Bell, Lizzie Johnson and Pickles Sour [the other stuffed animals]. G.N.! P.S. My nose is snuffley! Anica and I were missing Jenn today, but she was hoping a day off her foot would help her get through the last three days in London. I took Anica to places that Jenn and I have been before, but wanted Anica to see. In our opinion, no trip to London would be complete without a visit to the Tower of London. Anica now agrees. She said that the Yeoman Warder (i.e. "Beefeater's") guided tour there was the "best guided tour ever." They are really funny, and they have great stories to tell. We heard about our old friend William the Conqueror again, who built the first tower there after his conquest. And of course we heard about Henry VIII and Anne Boleyn, Jane Grey, and all the other bloody anecdotes. The Tower of London also houses the Crown Jewels, and a pair of ravens (because one king believed if the ravens ever left, the kingdom would fall). 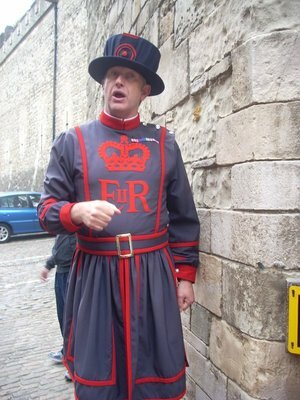 Don't call me a Beefeater! Next it was St. Paul's Cathedral, essentially the national church of England. It is beautiful - white, light and glittering with gold. It's the second-largest church we've been in (only St. Peter's in Rome being larger). Westminster Abbey is fascinating as well, but too crowded. Anica read aloud the Rick Steves' guided tour of the cathedral. Clearly, she was in the mood for sightseeing today. Very enthused, full of energy. It's great when she's like this. 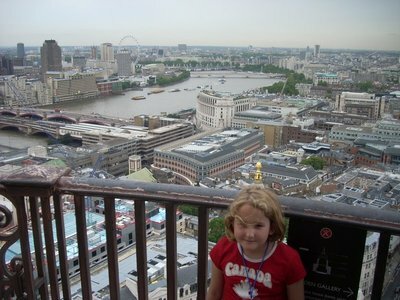 She even had the energy to go all the way up the 539 steps to the "Golden Gallery," 350 feet above the church floor. There, you can step outside and get a view of London that's actually as good as the London Eye. We had stopped after 250 steps for some time in the "Whispering Gallery," which is half-way up the inside of St. Paul's dome. The acoustics are so good on the rounded wall that you can whisper to someone on the other side of the gallery, and the sound will travel along the wall. It's like the person's right beside you, not a hundred feet away, when it works. Anica and I spent lots of time on that. There's lots to look at in St. Paul's. A Henry Moore sculpture, John Donne's effigy from before the 1666 fire, the American-themed stained glass (in the American Chapel, a WWII tribute), new-in-2005 paintings by a Russian artist, the Wellington, Nelson and Cornwallis monuments. As for Christopher Wren, the architect? The floor under the dome has a Latin inscription, reading "Reader, if you seek his monument, look around you." I love that. Back on the tube, we went to Kings Cross station. Can you guess why? That's right, the ultimate Harry Potter photo-up, platform 9 and 3/4. Anica has read all seven Harry Potter books and seen all five DVDs while on this trip, so this was a must. They now have a sign set up and a trolley that looks like it's gone halfway through the wall, so there really is something to see. Unfortunately, by now it was raining. So much for Hyde Park and the Princess Diana Memorial Playground. We took refuge in the British Library, next door to Kings Cross. 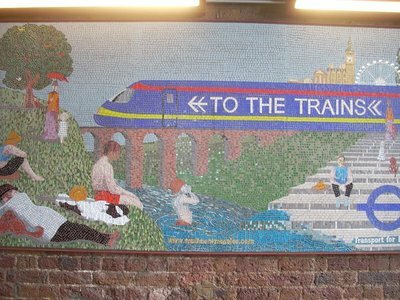 When Jenn and I were in London in 1999, this was my favourite attraction. It's probably the only library to display a better collection of rare, priceless books than Chester Beatty has in Dublin. The large, dimly-lit (to protect the books room) called "Treasures of the British Library" contains a Shakespeare first folio, a Gutenberg Bible, pages from Leonardo's notebooks, a Wycliffe Bible, handwritten manuscripts by Austen, Hardy, Wilde and others, even rough drafts of Beatles lyrics in Lennon and McCartney's own hands. It is absolutely stunning. Anica found her own interests there. They have interactive computer screens called "Turning the Pages," where you use your fingers to (virtually) do just that. She mainly looked at those while I stared with wonder down into the glass cases housing the real thing. Then Anica wanted to see a special display room of the Ramayana. We've seen numerous versions of this Hindu epic on our trip, notably at Angkor Wat and Bangkok's Wat Phra Keo, but also several places in India. This was a much clearer way to learn about the Ramayana because all the panels are explained in English. Anica spent almost an hour reading the gloss and looking at the illustrations. There's hundreds of illustrated panels, once folded into a book, but now individually framed to preserve each one. By then, despite clearing skies, it was time to get back to Jenn. We went out to a Chinese restaurant near our apartment. Her foot's still hurting, but perhaps the rest helped. Today (without Mum) we went to the Tower of London. We went on the Yeoman Wader tour. It was hard to understand at first but then it was easy. Even though I don't usually like torture, I sure like the chopping-of-heads, executing killing stories he told!! We then had lunch and went to St. Pauls Cathedral. Its been a cathedral since 604 AD. My 2 favrite things are: modren paintings of the crucificacions and the life of Christ and the Whispering Gallery: you can whisper into the wall and evreybody will hear you. So don't say anything to secret. Then Kings Cross. 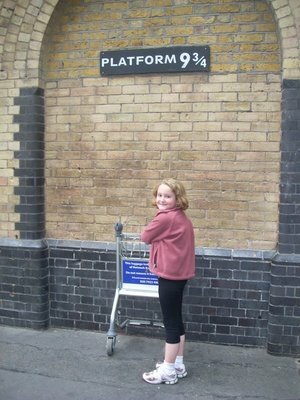 It was really cool and they'd put half a trolley in the wall for Harry Potter fans to pretend to push. Went home, met Mummy, went out, had dinner, went home, G.N. We waited for the bus across the street rather than walk to the tube station. This helped Jenn, whose foot is still quite sore. Then we hopped (no pun intended) on another bus at the station, avoiding the stairs to the underground, and took the double-decker to the British Museum. Anica thought this was pretty cool - we got to sit upstairs right at the front - but soon realized it gets pretty hot up there! 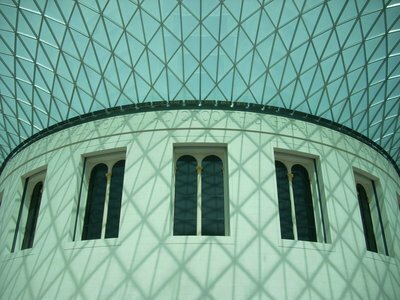 The British Museum gobbled up several hours, including a lunch break. We admired the Great Court that surrounds the round core of the Reading Room, restored in 2000, then concentrated our attack on the ground floor: Egypt, Assyria and Greece. Hey, you can't do it all. Anica loves Egypt, but is developing a fondness for things Assyrian, which we've also seen at Berlin's Pergamon and at the Louvre. She spent the last of her allowance money for the year on a illustrated kid's book called "500 Things You Should Know about the Ancient World." That's about 490 more than the Ontario curriculum thinks you should know about ancient history! Jenn didn't join us for Hyde Park. Too walking intensive for how she's feeling right now. But we'd promised to take Anica to the kids' stuff concerning Diana. 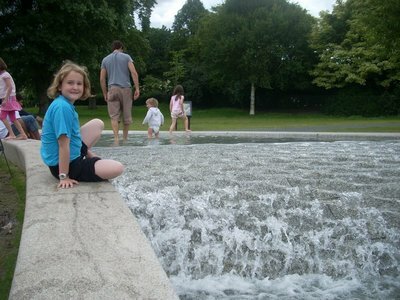 First, there's the Princess Diana Memorial Fountain, near the Serpentine Bridge in Hyde Park. It's not much to look at, but is a very interesting, varied, oblong course of water. A circular river. Children and adults alike take off their socks and shoes and dip their feet in, sitting on the marble edges. Anica found it cold, but fun to splash around in. cut the visit a little short, but it was a great time at the park. Today we went to the British Mueseum. We saw stuff from: Egypt, Assyria and Greece. I have 1-5 favrite things in each one. Egypt fav things: Ramses II face statue - a really cool Egyptian face. Ginger - a poor man that died before the Pyrimids were built. His hair and body are ginger. But the Egyptin dealer had a brother. When Ginger arived the brother dissapered. The Egyptian dealer might of killed his brother and made him look like a 5000 year old Mummy. Assyria: human headed lions - big lion gaurds the doorways to the Assyrian exibithion. Greece: Achilles and Penthisilla pottery - it was really cool. Sent Mum back home, went to the Princess Diana Memorial Fountin. I did a whole lap around before finding out not to by a meany guy. Went to the Princess Diana Memorial Playground, met a girl called Nyla, played in a house with bark and leaves, hurt my knee, went home, had dinner. G.N.! The day's just beginning. It's our last full day in London. The last full day on "Our Big World Trip." Tomorrow we fly home to Toronto. We're very excited. Just as excited as we were when we left. That's partially the point of travelling so long: the return to so-called "normal life" becomes part of the adventure. We're lucky; we have lots to look forward to at home. We've only lived in our condo for three months, and now we've been gone for over eleven, so it will be like moving into a new home again. While we were there, we had it painted and recarpeted, and had pretty much finished the decorating. My parents and Jenn's have taken turns visiting, living in and lovingly caring for the condo while we were gone. 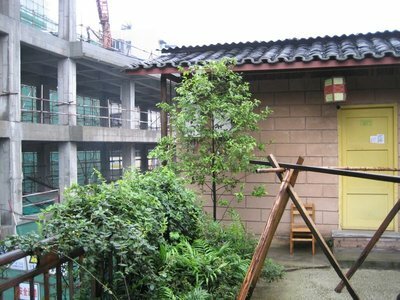 We didn't want to rent it out and risk having our new condominium investment wrecked. For the grand finale today (inshallah, as they say in the Arab countries we've visited), we'll go hang out in Convent Garden, then see a late afternoon matinee of "Spamalot," the Monty Python-inspired musical in London's West End "Palace Theatre." Then we have dinner reservations at "Rules," which purports to be London's oldest restaurant. It's certainly one of the more traditional. A splurge for our last night. Then we'll be zooming home on Zoom Airlines. Inshallah. We'll continue the blog for a while, deal with the return/letdown/adjustment, etc. So you'll hear from us when we complete the lap. How much of the British Isles can you drive on one tank of gas (sorry, "petrol")? It seems we're unintentionally trying to find out. We filled up while we were still in the Republic of Ireland, and then drove up the east coast to Larne in Northern Ireland. Larne pretty much closes at six o'clock on a Tuesday, it seems. Metal grilles are pulled down over store windows, and the only things left open were a bookmakers, a wine shop, and the Chinese-Thai restaurant where we ate. By then we had turned the car off (gasp) and spent the night at a B&B before driving just 1 or 2 more kilometres and parking it on the ferry. 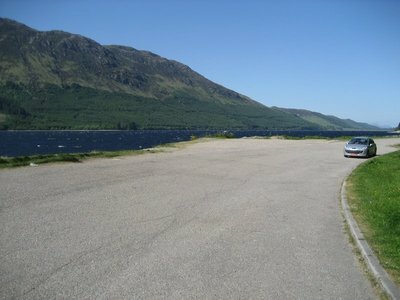 So it didn't take any petrol to get across the sea to Scotland. Is that cheating? Then we drove south from Scotland into England, passing by Liverpool, and stopping for the next night in Chester. Still a quarter tank of gas left. Chester turned out to be a great place to stop en route to London. We have a room at a small inn just outside the famous city walls. These narrow ramparts of brown sandstone are one of the main draws. You can walk all the way around, passing by many different styles of gates and towers. So we did. At two miles long, it was the perfect way to stretch our legs after all that driving. From the walls, you get great views of the river, canal, Chester racetrack,and even peoples' back gardens. There's also a nice pedestrian-only area in the city centre where we had our dinner. After a charming night's layover in Chester, it was on to London. Our final stop. But first, since we had time, why not stop in Oxford? As it turns out, there's lots of reasons not to stop in Oxford when you only have a couple of hours to spare. It's busy and it's hard to find parking, for example. Then there's our own special reasons, like not having a guidebook, and the fact that we did lots of stuff, and thought clearly, only just yesterday. Two days in a row was obviously pushing it at this point in the trip. Oxford does look like a lovely, historical town. It seems there may be a college here. We were almost going to take the hop on/off bus tour, but then the ticket-seller didn't want to accept our pounds sterling because it was issued in Northern Ireland. It looks funny! What a kick in the teeth to the loyalists of Northern Ireland. The rest of Britain doesn't realize the United Kingdom includes them. Finally, the guy said he would take the money, as long as it wasn't "Southern Irish, because we don't accept that." "That would be the Euro," I said. By then we'd missed the bus. Back on the motorways. After a false start, we left Oxford behind successfully on a second attempt. We'd promised friends we'd come for dinner at 5:00 PM, and we didn't want to keep them waiting since they'd so graciously invited us on short notice. The Jones family, in case you're trying to keep up, live in Guildford, just south-west of London. We'd met Phil and Melanie, and their three daughters Rhiannon, Rachel and Alice, on our Egypt tour. It was great to visit with them in their home, and tell our travel stories again, and hear theirs. They do a lot of home exchanges, which is something we'd like to look into. Our final task for the day was to find our hotel. Due a very complicated series of arrangements done to secure a week-long London flat rental, we were staying in the east end for the night. Our Etap hotel (which are an insult to the word "hospitality" but irresistibly cheap) was charmingly described as "behind the Esso station" off the North Woolwich Roundabout. Somehow, we found it. We just headed for where a whole bunch of Docklands hotels were and then went into the first one we could park at (a Travelodge) and asked them for help. Basically, I was asking: could you please direct me to your competition? Back and forth across Greater London we go! After picking up the keys to our flat, we asked the owner for directions to Heathrow. He got out the London A-Z and plotted a course for us through all of London that, miraculously, we followed to a tee. Even after 21, 675 kilometres of driving in Europe, Jenn and I were quite proud that we'd negotiated this route through London without a wrong turn. The rep from Peugeot took the car off our hands (with less of an inspection than a rental company would even do) and suddenly...we were car-free! 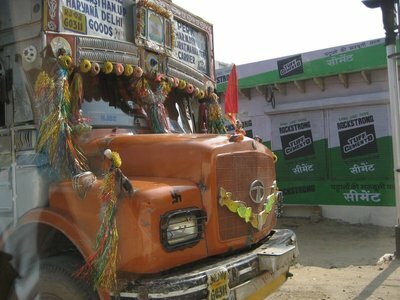 And completely relieved about it, after the frenzy of driving we've done in the past few days. Immediately, we got on the Tube. The owner of our flat, Ron, had set us up with Oyster Cards (for the public transit; they just needed to be topped up) and a London A-Z. That's all you need to get around London. Plus, we've been here twice before. Samuel Johnson wrote that "If you're tired of London, you're tired of life." 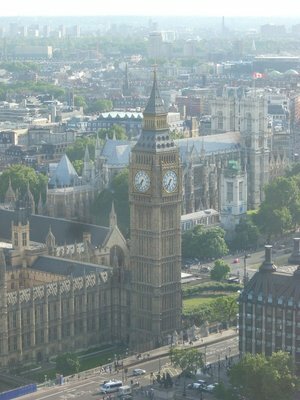 The good news: we're not tired of London! All three of us are tired of some aspects of travelling (for me, it's unpredictable showers and dingy kitchens), but we still love all that London has to offer. It's the reason we're ending the trip here. Anica thought the Victoria and Albert sounded like a good place to start. She had read about the "Family Backpack" activity kits they had. We'd been talking it up as a recap of things from all the places we've been. We saw a piece called "Tippu's Tiger," symbolizing the victories of Tippu, the Sultan of Mysore, over the British, for example. In India we'd seen his summer palace and tomb when we visited Mysore. And they had artifacts that belonged to Shah Jahan, the Mughal emperor who commissioned the Taj Mahal. That's interesting because both the Taj Mahal, and the Agra Fort are empty inside. We saw casts of the coffins of Richard the Lionheart, Eleanor of Aquaintaine, etc. who were so prominently a part of the French Chateaux we'd visited. Jenn said that the V&A was a museum she'd come to many times if she lived in London. Next up was Harrod's, just down the street. Anica was amazed by this place, as we thought she would be. Last time we were here, Jenn was six months pregnant, and we bought a teddy bear from Harrod's that became Anica's first stuffed animal. This time Anica played with all the toys in the toy demonstration area, and we looked at the Egyptian room, Egyptian escalator and foodhalls. But we didn't buy anything! I guess we saved our money for a night at the movies in Leicester Square. We have tickets to live theatre for later in the week, but London's West End is also a great place to see a big-screen movie. As long as you don't mind paying twice the normal price. You can stand in the middle of Leicester Square and see four huge movie-houses with one-of-a-kind enormous marquees. "Indy!" one read, trumpeting the new Indiana Jones. Another had giant models of the Panda from Kung Fu Panda. We went to see the second Chronicles of Narnia movie, "Prince Caspian," in a theatre with the best movie sound system I'd ever heard. The square was packed with Friday night partiers when our movie let out. We went "home" on the Tube - back to our London neighborhood of Canada Water/Surrey Quays. Although this East End neighborhood is far from posh, there's really nothing wrong with it. The diverse ethnic mix reminds me of Toronto, like walking down a stretch of Bloor or Dundas streets. After that final, fifteen minute walk from the nearest tube station (the closest one is being rebuilt) we were happy to be calling it a day. A very long, but fun, day. Jenn went out with friends today, Lottie, who lives in London; Marny, who lives in Hannover, and spent the weekend with us in Berlin back in March; and Davy, who had also made a trip into London to meet Jenn. It was just Anica and me for a whole day out in London. I took her to the National Gallery of Art, because Jenn didn't care if she saw that again. Anica printed out a themed trail on the gallery's "Artstart" computers. Her theme was "cats," so she learned about paintings with cats on them from the computer, and a map to follow. We also got her an activity booklet (the junior one, even though she could have handled the senior one, because it was just for fun). So that gave her lots to look for and do. I was looking for the Turner paintings, such as "The Fighting Tememaire," or "Rain, Steam and Speed," as well as the Impressionists, and other key paintings like Leonardo's "Virgin of the Rocks." Along the way, we spotted some paintings with "tricks" in them, like the distorted skull on the floor of Holbein's "The Ambassadors" painting. Basically, the NGA is one of the best collections in the world, a cross between the Orsay and the Louvre. Despite dazzling sunshine, we ate lunch in a church basement. A crypt, actually. Why? Because St.Martin's-in-the-Fields' "Cafe in the Crypt" serves great food. It's one of London's worst-kept secrets. Lunch today was delicious, and reasonably-priced. As for the bodies? They've long been moved to a suburban cemetery, so it's not as ghoulish as it sounds. They also have a brass-rubbing centre there, and Anica did one of William Shakespeare. She's going to give it to her Mummy, whom she's really missing today. A whole day apart! ...to the Cabinet War Rooms. Another one of my choices, of course, although I never got the feeling I was dragging Anica to these sites. She listened quite intently to the audioguide. It was easy to imagine what it was like during the Blitz, in World War II, with Churchill working in those underground rooms. They've been left untouched where they could, and meticulously re-created in other cases. It's a simple, but eerie, collection of rooms. It might have been a nicer start to the day if the Jubilee tube line hadn't broken down. Our 20 minute commute to Charing Cross ended up taking two and a half hours. The worst part was waiting. The best part was the walk. After the train took us just one stop, then conked out completely, we decided to walk from Bermondsey rather than wait forever for an overcrowded bus. It was about a mile long walk, then across the Tower Bridge (very cool) and past the Tower of London to Tower Hill tube station. Since it's on a different line it was running, and got us to Charing Cross where we were to meet Lottie and Marny. Which we did, but we were already exhausted. Marny had a very sweet gift for Anica: a collection of things she bought in Berlin, when she was with us before, including some photos, and also some postcards of Hannover, so Anica could see what Marny's hometown is like. It was very thoughtful. Back across the river, this time on foot by way of Hungerford Bridge, we ate lunch at "Giraffe," overlooking the Thames and in front of the National Theatre. It was a good choice: very kid-friendly for Sunday lunch. Lottie then took us to the Imperial War Museum, which is also in Southwark. 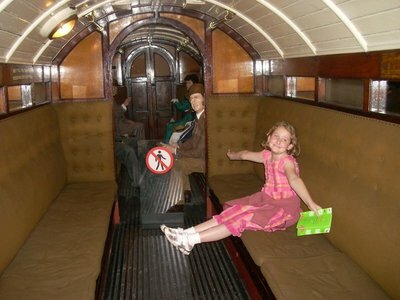 She was quite enthused about the war artists' galleries they have, and Anica liked the "Children's War" floors, which showed what evacuees and other children went through in England during World War II. 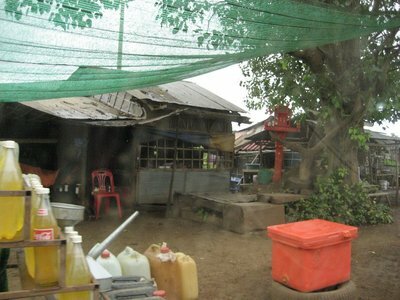 They even have reconstructed a Anderson Shelter and an entire war-time house. I liked their large-scale collection of tanks (like Monty's), guns (from WWI to cold-war antiaircraft) and planes (from a WWI bi-plane to the front end of a Lancaster bomber). Normally, I'm not a big military historian, but they've got these displayed all in one big hall, and other than the Smithsonian in Washington, I've never seen such a large and comprehensive collection in one space. Lottie treated Anica to some children's novels set during world war II. They're books that Lottie has loved, and she thought Anica would love them too. She probably will! In fact, she's already starting reading Judith Kerr's "When Hitler Stole Pink Rabbit." Soon it was time to say goodbye. Marny had to get her flight back to Hannover. We ate dinner at an Indian restaurant in our neighborhood of Canada Water, where the waiter was amazed at how much Anica read! Thanks, Lottie and Marny, for a great weekend. At long last, today was the day for Legoland! 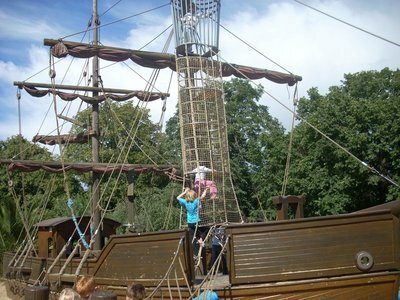 This was Anica's choice for an amusement park day out in Europe, even over Disneyland Paris (where she thought the rides and the mascots would both be too scary). Legoland is in Windsor, and we got tickets in London at the Waterloo station that covered the return train and shuttle bus, and park admission. Very easy, comfortable ride, but, like any theme park, expensive. Windsor is a gorgeous town, that exudes history and money. The castle dominates, looming over the train station and main street. Various building works are labelled by the monarchal monograms "VR," "GR," or "ER," depending on when they were built. Windsor is also the home to Eton and Ascot, and we rode past perfectly-manicured stables on our way to Legoland. Anica's writing about the Legoland rides, so I'll just give a few of my impressions of the place. 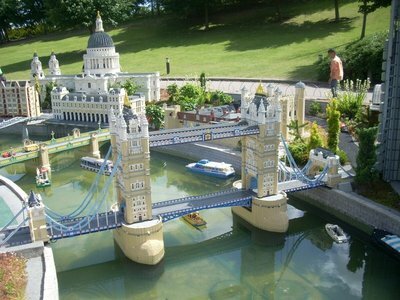 First, there are a lot of things built out of Lego, mostly decorations (25 million lego bricks apparently). Mini-land is truly impressive: they've built all the London landmarks from west to east, and then huge areas showing other places in Europe. We could have saved a lot of time and money by just touring mini-land instead of full-size Europe! They had Amsterdam and Dutch windmills, Edinburgh castle, Mont St. Michel, and many more unusual choices. Anica got her "driver's license" at the Legoland driving school. 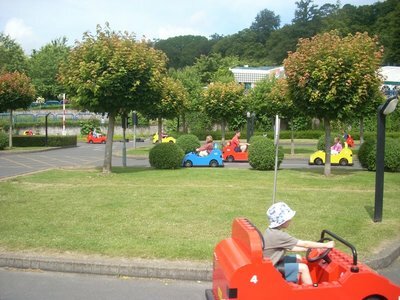 They watch a video, then head out into the mini electric cars on a realistic road layout. She has new respect for all those roundabouts I've driven through! Despite the safety talk, I think Anica was the only one to obey the stoplights. Good thing traffic was light! As for the rides, they were quite creative, and the emphasis was not on rollercoasters. Anica does not like rollercoasters, we found out today (feel free to read between the lines of this massive understatement). But she enjoyed all the other rides and attractions. All of us seem to be coming down with colds, and the lapses in brain power continue. Somewhere at Legoland lies Jenn's polar fleece jacket, left behind, after touring 28 countries with us, just days before we go home. She bought a zippered hoodie as a replacement because it's not consistently warm enough here to go around in just shirtsleeves. Tomorrow is July. We left home in July of 2007. Wow. 1) Our guest house in Larne is big and very fancy. Larne is also a very quiet town. 2) I love P&O ferries! They have a restaurant, bar, shop, beruau de change, play area (2-6 year olds, so I'm to old), and everything! We watched a movie called "Click" on it. This time wasn't as fun/good as the other time exept the movie. 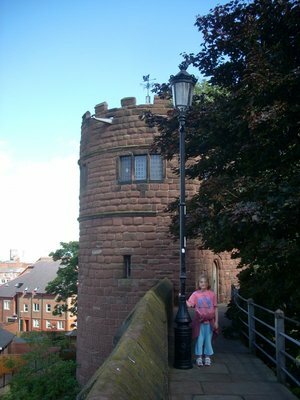 3) In Chester we walked the 2 (oh-my-gosh-long) miles on the city walls. It was very enjoyable. 4) We ate at Bella Italia which is a chain (for dinner). 5) We just dropped our car off! We take the tube. 6) We saw Prince Caspian. 7) The tube is very hot! 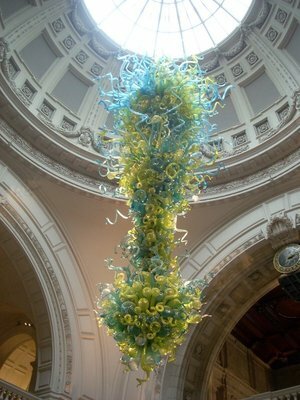 8) On the first day we went to the V&A. We got the family backpack and saw world wide stuff. 9) We had much fun with family backpack with cd player, fans, toys, colouring, guides and lots more! 10) We saw artwork from Europe and Asia. From Roman columens to Islamic carpets, it had everything! Today Mummy went off with her friends Marny and Lottie. Plus Davie (a boy). But me and Dad had fun. We first went to the Natinol Gallerey and saw my favrite paintings! I have 3! 1. The train and the bunny: it had a train and a brown striped (?) buny. [note: this is Turner's "Rain, Steam, and Speed"]. 2. Minerva, Venus, Juno, Paris, and the goddess of war. Minerva, Venus and Juno are competing to win a golden apple. Paris is handing it to Venus (Minerva or Juno are prettier). The goddess of war is upset that Minera or Juno diden't win. [note: this is Rubens' "Judgement of Paris"] 3. The children, the cat and the eel! Simple! Read the title! [note: this is Judith Leyster's "A boy and a girl with a cat and an eel"] We had lunch at St. Martin in the fields. YUMMY! We then did Brass rubbing. And then we went to St. James Park. We saw a bird with a blue beak (?). Went to Buckingham Palace, saw the guards, played in the playground, saw the Cabinet War Rooms! Went home, had dinner, G.N., saw mummy, G.N.! For Sure. At least tonight. "I see Marny! 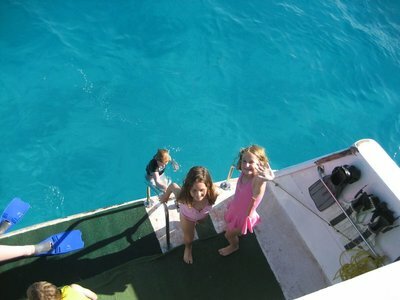 I see Marny!" Jumping up and down as I saw out of a papershop window. "Hide, hurry, run!" It was everything. We walked over and she said "Hello." And then she gave me my present. "Ooooh, ah?!" It came with: a beatifly lighthouse covered box with an Ampleman pen and pencil, a view from the Reichstag pamphlet, a photo booklet by Marny, postcards and candys. We then met Lottie and had lunch. Off to the War Museum! My favrite part: the Children's War (especially cartoon place). Lottie bought me three books! My favrite is When Hitler Stole Pink Rabbit. 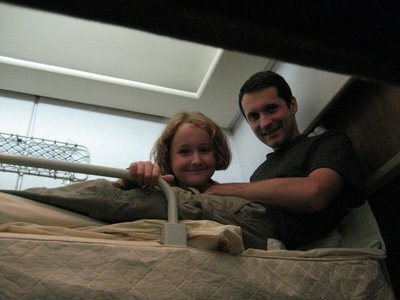 The others are Goodnight Mr. Tom and Carrie's War. Went back, said g.b. to Lottie, tube, coffee break, g.b. to Marny, decision time, tube, dinner, G.N. Here the rides we did and what they were. Sky Ride: ride around slowly on a view ride. Fairytale Brook: take a boat ride through a fairy tale forest. Traffic ride: ride a Lego car through roundabouts and roads! Ballon School: push your ballon up while it turns itself around for great views. Charioplane: basic swing ride. Rat Trap: go on this playground and your sure to get lost! Only one slide and hard to find, go wild! Dragons Aprentice: a too fast and long queue ride. Spinning Spider: go crazy with spinning! Loki's Labrinth: A Viking-themed maze. Mini Land: see all the "mini" sights in lego. Sky tower: pull yourself up to the top and drop down. Show was excellent, dinner was, train wasn't, tube ok, bed, well lets just say G.N.! 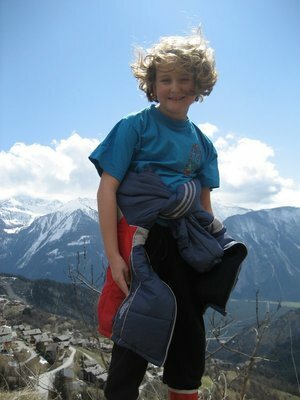 We're mum, dad and kidlet from Toronto, Canada who spent a year travelling around the world (July 07-July 08). We had an absolutely amazing time, continue to travel and would do our trip all over again in a heartbeat. If you have any questions about our trip, please don't hesitate to ask. "See? You're getting to see all sorts of wildlife..."
"What? No crunchy aloe bits?!"